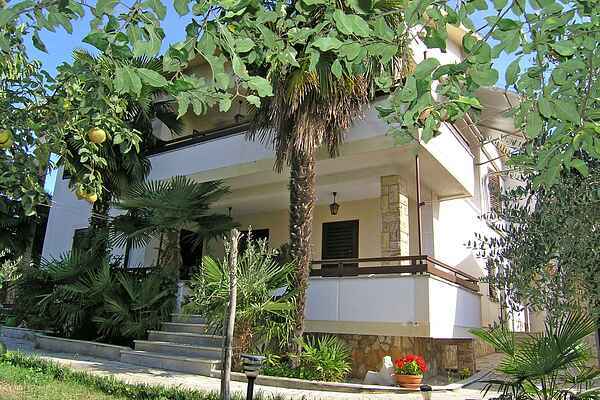 Very conveniently located apartment in Porec, with all the ingredients for a great holiday at your fingertips! Apartment on the ground floor, with access via a few steps. Neatly and simply furnished, with all modern comforts for a pleasant holiday. Private entrance hall. On the covered terrace you can eat a delicious al fresco Croatian breakfast. Near the house is a shared enclosed garden with palm trees, where children can play, with a covered patio and a barbecue for a nice evening meal. Supermarket, bank and restaurant are located within a radius of 300 m; the beach is only 1 km away. Porec is known for its many water sports facilities, such as paragliding and water skiing, with rental (sail) boats and jet skis. In the historical centre you can admire the St. Euphrasius Basilica from the Byzantine period. After climbing the bell tower you are rewarded with a fantastic view of the city and the Adriatic Sea. On a clear day even Venice is visible! This romantic Italian city is easily accessible from Porec by boat. Tips for fun day trips include ancient Novigrad (15 km) and Umag (30 km), both on the Adriatic coast.